Huawei E5788 is new LTE Advanced Pro mobile hotspot and was available on the market for few months. Upgrading from the predecessor Huawei E5787 LTE Cat.6 mobile hotspot, Huawei E5788 has many new features to highlight. However, some people don’t know the new Huawei hotspot 4G or don’t know what has been improved in the new hotspot. 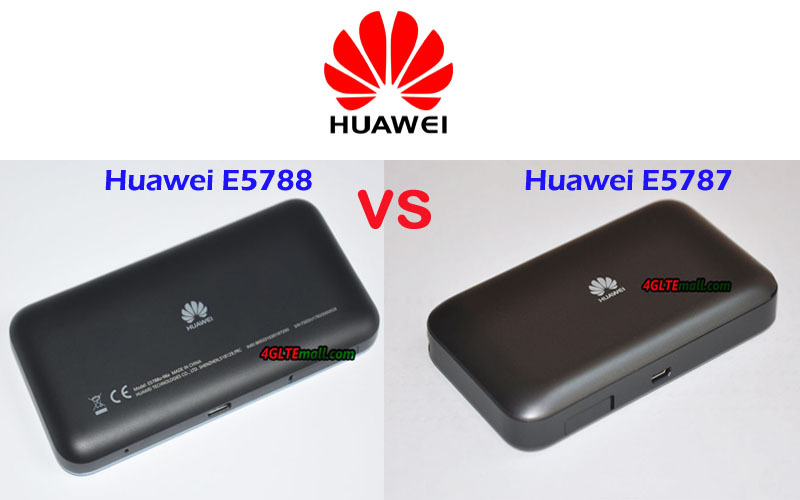 Someone may ask what the difference is between Huawei E5788 and E5787. Today, we will have a review of the difference between the new Huawei 4G hotspots. If you had used the Huawei E5787 Mobile WiFi hotspot, you may know the touchscreen, which is the first 4G Mobile hotspot with a 2.4-inch touchscreen. As a high-level LTE hotspot, Huawei E5788 followed this feature but unlike the Huawei E5787, the touchscreen is on the left half of the front body. The touchscreen of Huawei E5787 is in the middle of the front body. They both have standard Micro USB 3.0 interface. 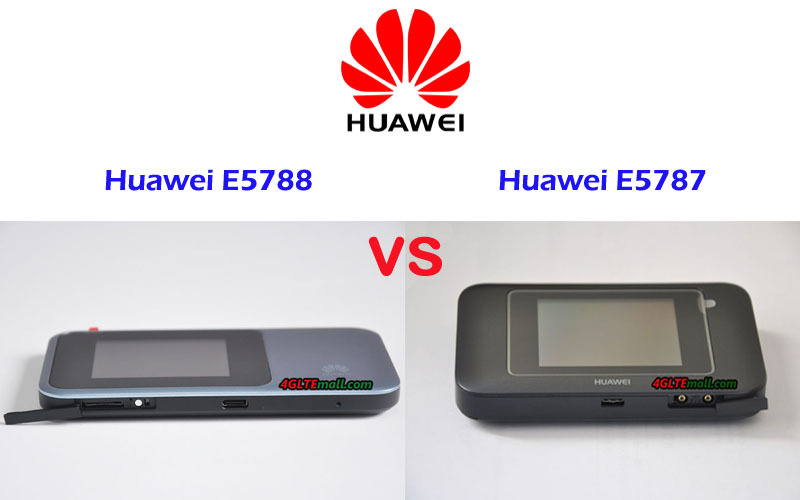 The Huawei E5787 has two TS-9 connectors for external antenna, however, the Huawei E5788 doesn’t have a connector for external antenna, which is widely criticized. The two connectors of Huawei E5787 are covered by a small cap, and it’s at the side of the USB port. At the side of Huawei E5788 USB port, it’s the SIM card slot. The two mobile hotspots both use Micro SIM card size. They both have the power button on the top edge side of the body. 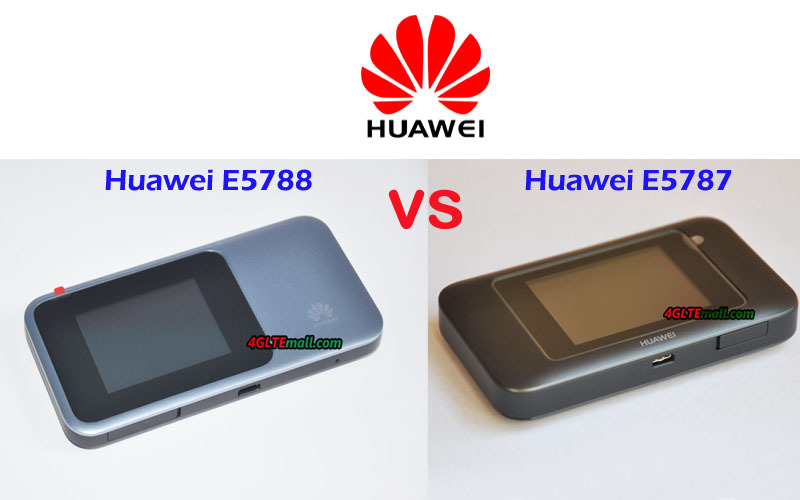 The one point of the difference between of Huawei E5787 and E5788 is that the back cover of Huawei E5787 could be removed so that the users could insert the SIM card to the slot. And the Huawei E5787 could be removed for exchange. However, the back cover and battery of Huawei E5788 are non-removable. The non-removed battery feature is very similar to Huawei E5786. From the specs table, we can see the Huawei E5788 is much more advanced than E5787. It could achieve download speed up to 1Gbps, which is almost three times than that of E5787. The advanced LTE features make the E5788 more expensive than Huawei Router E5787. However, the missing of an external antenna connector in Huawei E5788 is not good for many users if you are located in areas of weak signal. The Huawei E5787 antenna and the removable feature is good to mention. Huawei E5788 LTE Router could support maximum up to 32 users while Huawei E5787 only supports to 10 WiFi-enabled devices. So if you have a group of people for internet access more than 10 users, the Huawei E5788 would meet your requirement. The Huawei E5788 is powerful in functions; however, the Huawei E5788 price is in high level now. Huawei E5787 price is much lower than E5788, and for most users, it could fully meet the requirements for daily internet access.